"The Baby and the Boss...gives an intimate glimpse into the inside workings of politics in a big city. 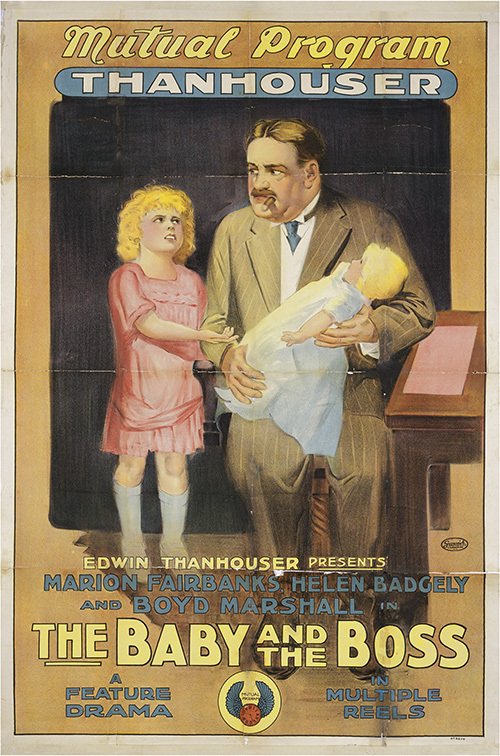 The innocent, but determined, little invader of the private office of Dave Hinkey, 'the harsh boss,' is none other than Helen Badgley, 'The baby,' in the double title-role, who seeks influence for patrolman MacCracklin, sister Irene's sweetheart. The scene in which Helen presents herself before 'Hinkey' at the busiest moment of his career, is a rich bit of comedy, brimful of human appeal. Hinkey and Helen are best friends within the space of a couple of seconds. And after that, MacCracklin gets ahead all right." "When the captain was a patrolman on the mounted squad he stopped a runaway, and so saved the lives of 'The Baby' and her sister, Irene. He fell in love with Irene, but he did not want her to marry a common patrolman. 'The Baby' learned that the man who had saved her and her sister from a certain death could not be promoted without influence. She also overheard her father say that Dave Hinkey had all the influence in the town, so she lost no time in finding the office of 'The harsh Boss,' as he was called in those days, and she asked him for the one thing needful to promote the young policeman and make her sister happy. The boss was right in the midst of a private conference, fixing up the slate for the primaries, but 'The Baby' got in somehow - and he didn't turn her out. In a minute or two, she had made him her abject slave. He took her to the mayor, and a few days later Irene's lover was made a sergeant. That was how MacCracklin got his start. Now he's the best captain on the force. He and Irene are married. And it's all due to 'The Baby' and the way she landed 'The Boss.'" "A two-reel production built around the recent police games in which New York's police force participated. The police games furnish some entertaining and informing incidents, including a sham battle, a rookies' drill, fire drill, work by police dogs and the like. The plot is slight but clever. It pictures the way in which the Kidlet prevails upon Boss Hinkey to promote her favorite policeman. The number is fresh and interesting throughout."